Welp. 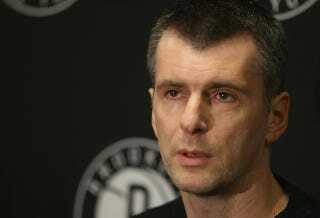 According to Bloomberg Business, Mikhail Prokhorov, the Russian billionaire who just five years ago plunked down $220 million for an 80 percent share of the Brooklyn Nets and then went ahead and built a massive new arena in Brooklyn, is looking to sell his team. Because of their home in the No. 1 U.S. media market, and the infrequency with which marquee franchises become available, the Nets might fetch more than the record $2 billion former Microsoft Corp. Chief Executive Officer Steve Ballmer paid for the Los Angeles Clippers in a frenzied auction sparked by racist comments made by former ownerDonald Sterling, [valuation expert Peter] Schwartz said. "The fever of a trophy asset goes beyond financial analysis — as we saw in Los Angeles," Schwartz said. To recap: Prokhorov bought the Nets for $220 million, ran the organization poorly, and is now in line to dump his ownership stake for somewhere around $2 billion. It's going to be hilarious when NBA owners try to convince us that owning an NBA team isn't a great racket during the next round of CBA negotiations.